Veactor™ is an all-in-one device that replaces standard power transformers and revolutionizes the power grid. Surge/EMP Protector – Dissipates excess energy automatically. A persistent electromagnetic field is a significant byproduct of modern electrical transmission, and it results in heat and lost power. That excess heat also leads to more wear and tear on the electrical infrastructure and requires systems for managing and dissipating it. This problem has existed since the invention of electricity — after so many years, utilities now just take this loss for granted. Physicist and inventor Richard Dellacona designed Veactor™ in response to that problem. Veactor™ xPath™ Technology takes heat almost entirely out of the equation by collapsing the EM field 60 times per second, allowing electricity to flow virtually unimpeded down the line rather than generating wasteful heat. Combining new engineering and classic physics, this "hardware smart" solution introduces an entirely new type of power – Balanced Current (BC). 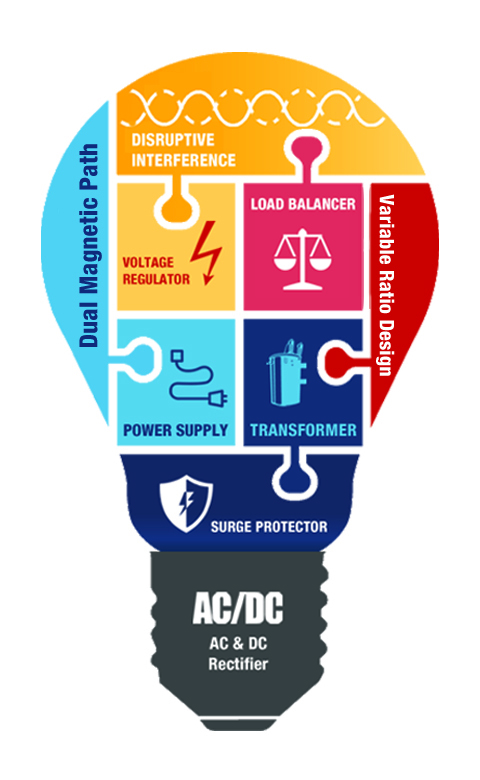 Our reliance on AC and DC power is over;and a greener solution is here-- xPath™ Technology and BC power bring transformer design and the electrical infrastructure out of the 19th and into the 21st century. Modern electrical transformers are surprisingly simple devices. They can only manage a fixed ratio of power input and output, and can't switch between AC and DC power. Veactor™ replaces this simple hardware with smart hardware that operates on a variable power ratio. The technology can handle and respond to any load, as well as any type of current. This power-on-demand solution will empower the smart grid of the future and redefine energy efficiency.